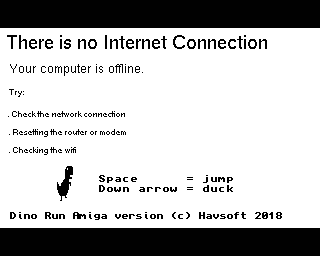 Welcome to Havsoft, a site dedicated to games from a simpler time. All the games for download here are fun, simple to play but difficult to master. Most have been created by Havsoft using Blitz Basic but a few are being hosted for other game programmers. Also, I write games for the Commodore Amiga and these can be download as well to be played in emulators or copied over to a real machine. Dinorun is an Amiga version of the Google Chrome game. How far can you get? Special surprise for those that can get far enough! A remake made by Batstich based on the old ZX Spectrum game - Lunar Jetman. Lunar Jetman was the follow up to Jetpac and like all games of the time was very unforgiving. Give it a whirl - t's a great remake. 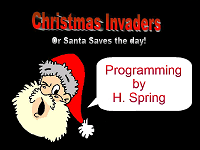 Christmas Invaders is a space invader game inspired by the December 1982 C+VG cover. Click to find out more and download the game. Created for a shoot-em up competion, Darkspace is me trying to create a game with lots of bullets going everywhere and invoke the feeling I used to get playing Salamander. Frogger is remake of the old Sega arcade game with updated graphics and lots of secrets to find. How far across the road can you get? A one button game before one button games became the norm on mobile phones. Abduct the creatures from each planet using your tractor beam but watch out for the bombs.